After an event is created, Power Manager stores the event in an internal event store. The event store’s contents are visible in the Power Manager application. Power Manager schedules events. A scheduled event is an event whose triggers are active and enqueued. Power Manager’s Scheduling Engine coordinates and schedules your events and ensures they are triggered appropriately and performed only if their criteria is met. 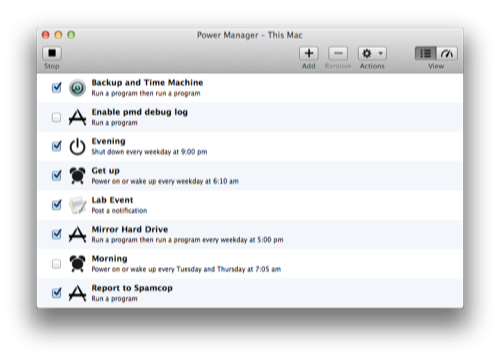 You can stop and start Power Manager’s Scheduling Engine at any time. When stopped Power Manager will stop scheduling new events and remove any previously scheduled events. When the Scheduling Engine is stopped no event will be triggered or performed. If the Scheduling Engine is running, select the menu item Scheduler > Stop Scheduler… to stop the Scheduling Engine. If the Scheduling Engine is stopped, select the menu item Scheduler > Start Scheduler to start the Scheduling Engine. If the Scheduling Engine button is disabled and is showing the title “Unavailable”, this means the Power Manager background daemon process pmd is not responding. In most situations, restarting your Mac will fix any problems. If a restart does not fix the problem, please see the trouble shooting section in the Power Manager Administrator documentation. If the scheduler is shown as “Pending”, this means Power Manager is waiting to connect to the background daemon process pmd. Typically the pending state will only last a few seconds.